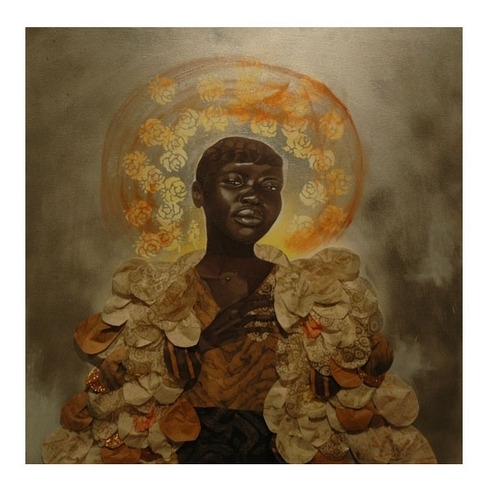 Mosaic Project Artist Jamea Richmond-Edwards will be attending PCA&D’s First Friday Lancaster reception tonight in the PCA&D Gallery, 204 N Prince Street, Lancaster. 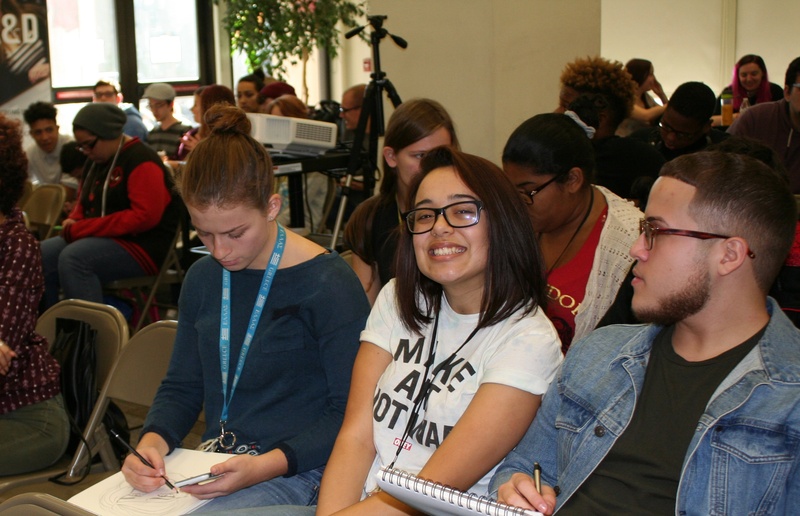 This morning at an Artist Talk, she spoke about her path as an artist to PCA&D students and our Mosaic Project visitors from McCaskey High School, and members of the community. Talking about her Detroit upbringing in the 1980s, she said her work has been influenced by the predominately black city as well as the unequal application of the “War on Drugs” and the crack epidemic. Her recollections of her childhood Detroit include “hair city,” automobiles, and the Detroit Institute of Art, but she never was exposed to a female African American Artist until her sophomore year in high school, when she saw Renee Cox’s “Liberation of Aunt Jemima and Uncle Ben, which challenged stereotypes. She studied at historically black Jackson State University, receiving her Bachelor of Art in Art, and was exposed to Afrocobra art, which started as a visual component to the black cultural revolution of the 1960s. Later she earned her MFA Painting from Howard University, where many artists from the Afrocobra movement were faculty. Other influences are the Euro-centric Old Masters, which influenced her painting style, and artists of the Amber Collective, an egalitarian arts group from Philadelphia. Her art, which is is quite autobiographical according to Richmond-Edwards, pays homage to strong female figures in her life, from her grandmother Gloria, to her aunt who died from drug abuse, and her mother who overcame drug abuse. Much of her art asks questions about the struggles of the people of black communities, including Detroit and her current hometown of Baltimore, and the inequalities caused by violence, economic issues and the scourge of drugs. Early work of hers, done in mourning for her aunt’s death, contrasts the beautiful woman her aunt was with the ugly monster of drug addiction. 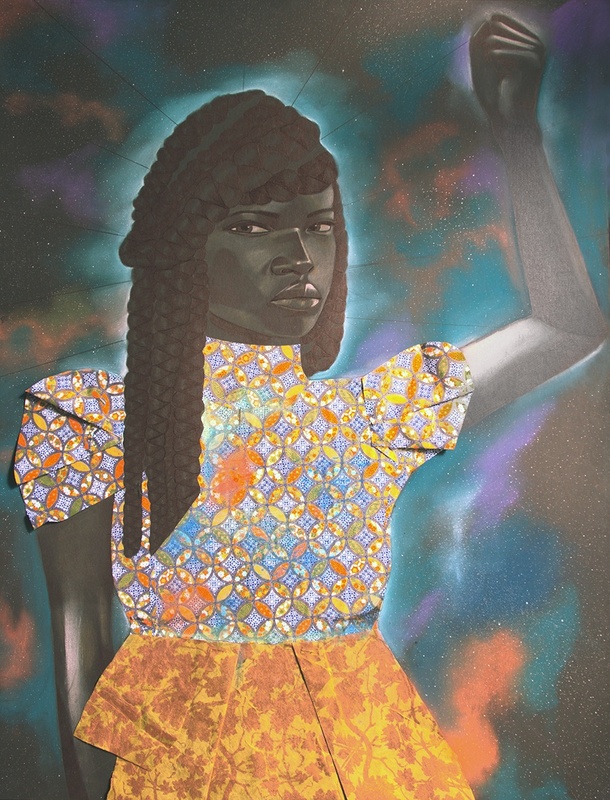 Her collages and ink work, including blank ink on black paper, have been staples of her work until the present, as has been her attempts to portray the struggles and fears of black women in an accessible way. She also suggested that artists need to “trust their gut.” While she believes she has benefitted from the advice of critics, one of her pieces “Wings Not Meant To Fly,” was once panned by a prominent critic, but is now a permanent part of the set of the television show Empire. Richmond-Edward’s work has garnered the attention of art critics including in the Washington Post and the Huffington Post’s “Black Artists: 30 Contemporary Art Makers Under 40 You Should Know”. 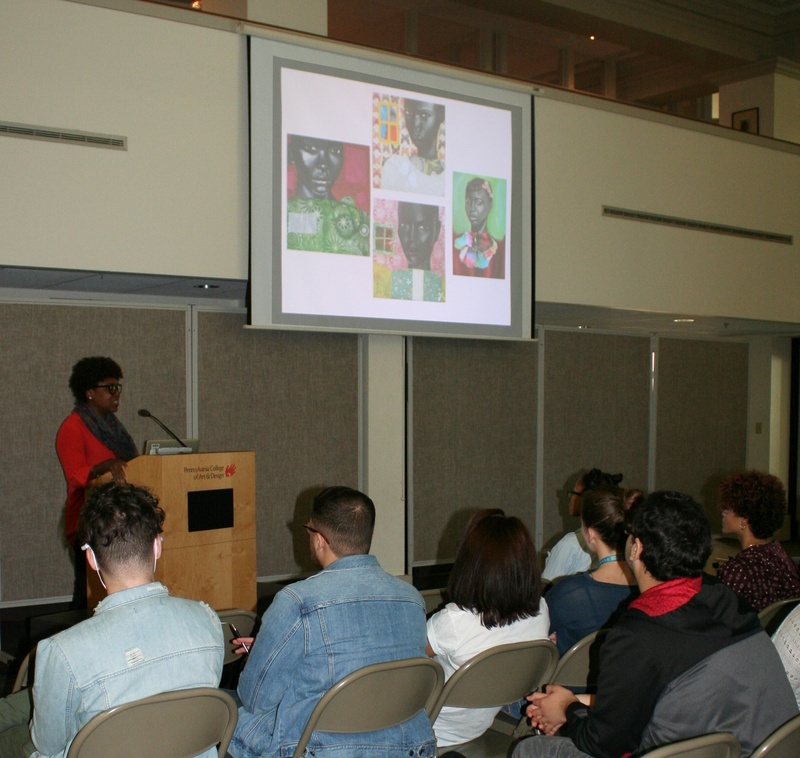 Jamea has exhibited her artwork nationally and internationally including the Delaware Art Museum Centennial Exhibition, Wilmington, Delaware; Rush Arts Corridor Gallery, Brooklyn, NY; Parish Gallery, Washington, D.C. and Galerie Myrtis, Baltimore, Maryland. Her works are in the permanent collection of private collectors across the country and the Embassy of the United States in Dakar Senegal. 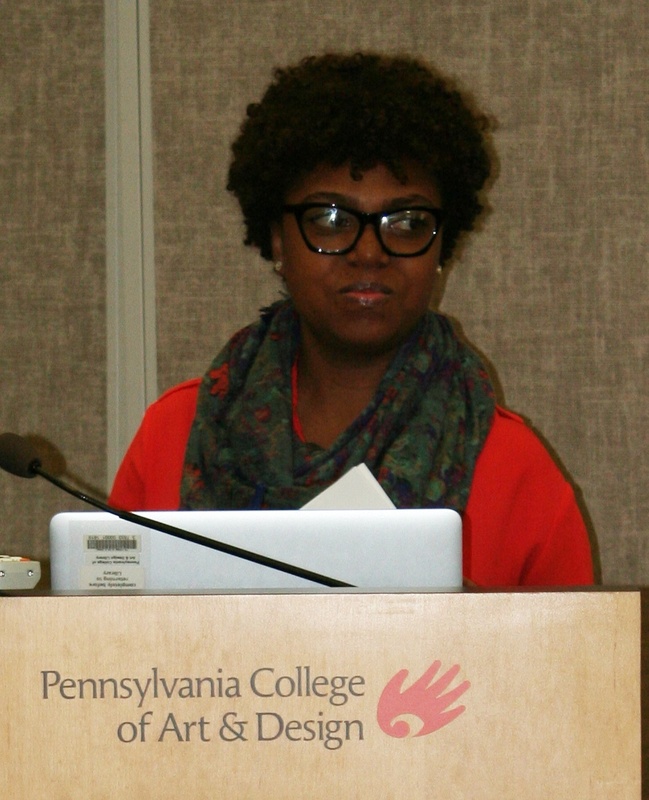 Jamea Richmond-Edwards will be at PCA&D this afternoon working with the students from McCaskey High school and tomorrow working with the students from the school District of Lancaster’s middle schools. The other artist for this year’s Mosaic Project, Christian Robinson will visit and given an artist talk on October 28th. Christian Robinsonis an illustrator who likes to tell stories with pictures, making a living as an illustrator and animator in San Francisco. He’s worked with Pixar Animation Studios, The Sesame Street Workshop and illustrated a number of award winning picture books including Josephine by Patricia Hruby Powell (Chronicle), which won a Coretta Scott King Illustrator Honor, a Robert F. Sibert Honor; and Gaston by Kenny di Pucchio (Athenum), which was named a Best Book of 2014 by Horn Book, Kirkus, and Amazon. His latest book, Last Stop on Market Street by Matt de la Pena (G. P. Putnam’s Sons), is a New York Times bestseller.